Now, I know that this card says 'Happy Birthday', but the original card I CASEd actually said 'Merry Christmas'. A huge thank you to Bibi Cameron for the inspiration for this card. It's not too late to make your Christmas cards this year, check out our Holidays selection of products. 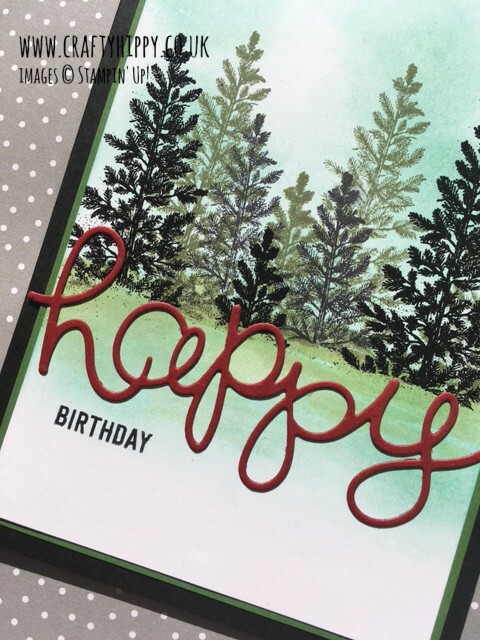 The stamp set is our longest running stamp set Lovely as a Tree, which is also available in Clear Mount. I stamped in Basic Black and Always Artichoke. I also used some black embossing powder from out of my craft cupboard, but the original didn't have this. I used a retired die for the 'happy' sentiment, but the original project used the Christmas Greetings Thinlits Dies, which comprises of the words 'peace', 'jolly' and 'merry'. These dies are actually in our Clearance Rack and are reduced to £9.30. Well worth investing in! I used an Aqua Painter to add some colour beneath the tree-line in Always Artichoke and in Pool Party - you simply give the ink pad a gentle squeeze and use the ink that collects in the lid. I used the Thoughtful Banners stamp set for the birthday sentiment, but you can use any of our stamp sets to find a sentiment you like. Take a look around this site for more cardmaking, scrapbooking and home decor inspiration.